The Test Editor provides a rich UI for creating, editing and debugging Muse Steps. The editors for macros and functions are built on the same base - so the functions are very similar. The Test Editor is described here. 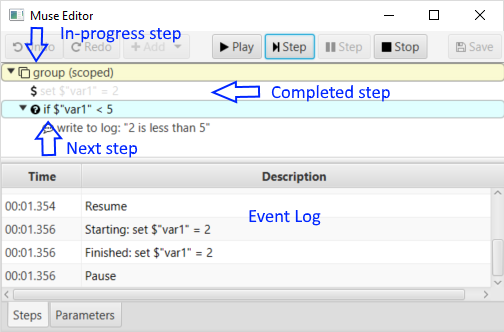 The toolbar provides commands for step editing, test running/debugging and saving changes. The step tree is where you create and edit steps in the test. Use the tabs to edit different parts of the test. The Parameters tab provides default parameters for the test. These may be replaced with other values by a parameterized test suite, allowing one test to exercise many variations of the same workflow. Use the play or step buttons to start a test. Read how to edit a step. Much like test variables, each parameter is named. The name fields in the editor are plain strings and do not need to be quoted. The value for each parameter is a value source.